Was in the mood for some romance, this one didn't work for that really (probably because I didn't like the guy who was slated as the romantic lead) and this book's flow really took a long time to get going. It didn't help that I think that there were some loose threads in the end that just made me shake my head. 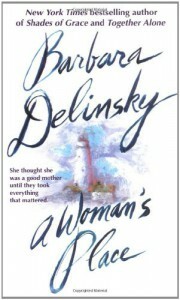 I loved Delinsky's "The Summer I Dared", "Suddenly", and "Coast Road." This one just didn't sing for me as well as those books did. "A Woman's Place" has Claire Raphael floored when her long time husband Dennis surprises her with a request for divorce and demand she leave their home. Claire doesn't understand why Dennis is all of a sudden saying they haven't had a marriage in a while, he's also saying what a bad mother she is to their two kids. Though Claire is a successful though busy businesswoman, she thought she was juggling everything wonderfully. When the courts and a court ordered doctor tell Claire that the choices she has made in her life is wrong, she wonders what her future is going to hold. I liked Claire. I just wish she had been more of a fighter and I hated that she needed to rely on her best friend and business partner Brody so much. The fact that Dennis and the courts accuse Claire of having an affair with Brody, I have to wonder why in the world she would even contemplate starting a relationship with him. There doesn't seem much to recommend Brody (IMHO) he doesn't listen to what Claire says (her real concerns of losing her kids) and thinks that everything is going to work out okay. I thought it was interesting how this book shows how a woman is punished for being great at her job. Her husband resents her, her sister does too (slightly) and I just wish we had seen Claire at her job and actually showing why she was good at it. Dennis is just a jerk. There is a slight change to the character in the middle and end of the book, but that didn't work for me at all. There are some characters that are so over the top and don't feel realistic due to how in the world would they have not lost their licenses or been censored (the judge and court ordered doctor). I hate that some of these people don't get in trouble for what they did and said though. Some of the book feels quite dated. There also seems to be some call-out regarding abortion that I can't believe would be allowed to be used in a court case. Also several men in this book paint Claire as unnatural for having a career. This book was first published in 1997 and that definitely doesn't feel like something that would be a thing back thing. I don't know. Maybe it's so normal for me to see women in the work place and the fact my own mother, grandmother, and aunts worked it didn't hit me as it being strange. I wish I had liked the romance, it just felt too paint by numbers. Maybe if we had Claire opening up to someone new it would have worked better for me. The book ends on a happy note that I wonder at based on what comes before.